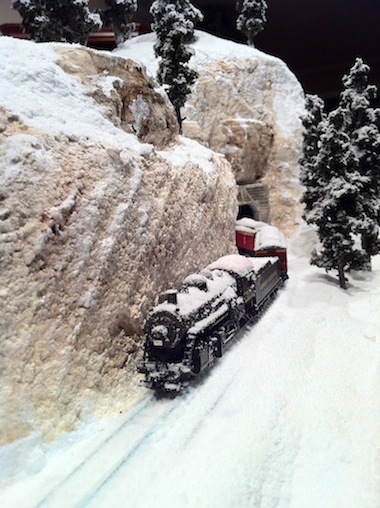 Modeling a winter diorama may seem a little intimidating, but it’s not that difficult really. It’s a great way to show off your modeling skills during the winter season, and especially during the Holidays when most families have a lot of visitors coming around. I decided to do one recently partly because I wanted to demonstrate a winter diorama here on a web page, partly because I was inspired by the season and by the cover of the latest issue (December, 2010) of NMRA Magazine, and also partly because it gave me a refreshing break from working on my regular layout. Sometimes it’s nice to break away from the big projects and do a small project. It allows you to do a nice scene very quickly and gives you a great sense of accomplishment when you actually finish it. It’s so rare that model railroaders actually ever finish anything; that’s why a small project is so refreshing. After doing this small winter diorama, I now feel enthusiastic about going back to working on the larger layout. 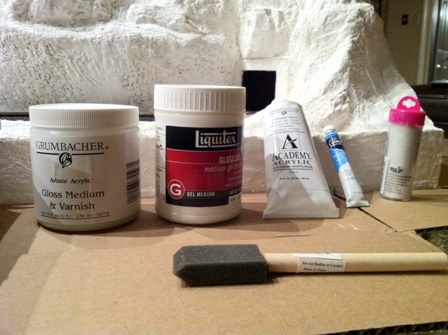 The items you will need are shown here, including white snow powder, various water-soluble paints (slate gray, stone gray, yellow ocher, burnt umber), spoon, mixing bowl, foam brush, pain brushes, small trowel. small bottles in which to mix the paint washes, the ingredients for the snow goop described below and the sparkling crystals for the final touch. 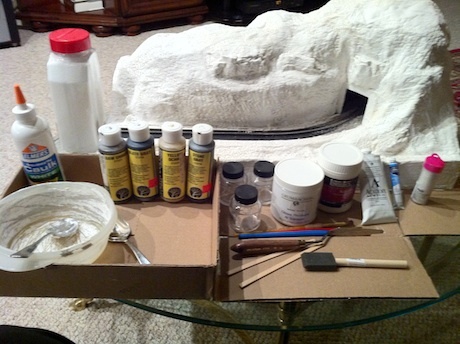 In the background is the diorama with the completed terrain and the rocks in place. I started by making a small terrain using the N Subterrain Scenery Kit sold by Woodland Scenics . You don’t need this kit to make it, since all the elements of it can be purchased separately; but the kit does have all the stuff you need to create the basic terrain for your diorama – including the Styrofoam base and profile boards to make the edges, the riser to make the surface for the track, and the plaster cloth to build the terrain. First you have to put together the base and the edges with the Styrofoam boards. Then glue the riser to the base in a curved fashion or however you want the track to be displayed. I then decided to create a tunnel over one end of the riser by cutting a thin Styrofoam board into three rectangular sections. I glued two of these to the sides of the riser and then glued the third one onto the top edges of the other two in order to form a rectangular-shaped tunnel. 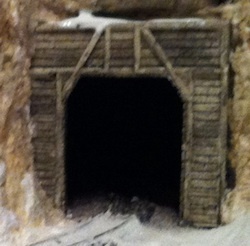 I then took a purchased preformed tunnel portal and glued it to the front end of the tunnel. Then I made newspaper wads to fill in the space where the mountains or hills will be. Refer to the Terrain page to see how to do this. You have to use your imagination to create the kind of terrain for this winter diorama that you want by using larger or smaller wads or by increasing the number of wads on top of each other. You may want the area to be only mildly irregular and fairly flat. Or you may like large mountains with rocks and cliffs, which is what I chose to do for this project. After you have placed your newspaper wads the way that you want them, you can tape them in place if you like with masking tape. Then cover the wads with water-soaked plaster cloth. I covered the riser with plaster cloth as well. I used a few different kinds of rubber rock molds for variety. Then I used Hydrocal mixed with water according to the directions on the box and poured the mixture into the molds to make the rock castings. Make sure you spray the inside of the mold first with a mixture of water containing a drop or two of liquid detergent before you pour in the Hydrocal. Otherwise, you will have a hard time getting the castings out of the molds later. I let these dry for 24 hours, then removed the rock castings from the rubber molds. I then had to figure out where I was going to place the rocks in this winter scene. After I decided this, I then cut out openings in the plaster cloth. The size of each opening should be about the same size as the rock that’s going to go in that space. I then placed each rock in the opening where it was supposed to go and used Sculptamold to fill in the spaces between the rock and the surrounding plaster cloth and also around the edges of the tunnel portal. I let this dry for another 24 hours. 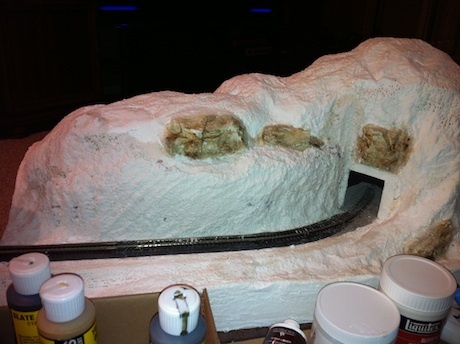 On top of the riser, using white glue, I attached the roadbed where I wanted the track to be placed. Atlas sectional track, in this case N-scale, but it could be any scale, was glued down onto the roadbed. I used foam pins to hold the track and roadbed in place while the glue dried. 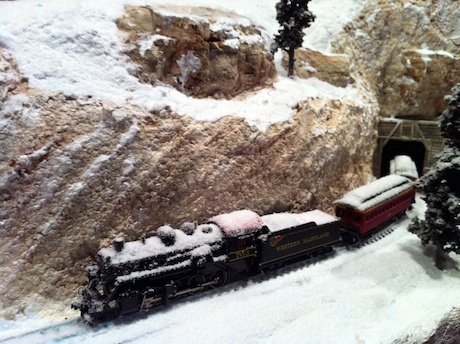 I used a spoon to sprinkle dark gray ballast between the ties and on either side of the track at the opening and just inside the tunnel where the snow would not be covering it. I used a pipette to drip a mixture of isopropyl alcohol, water and white glue (1:1:1) over the ballast to hold it in place. I used Sculptamold to cover all the holes and defects in the plaster cloth. I also used it to cover the cliffs and, using a spoon, molded the Sculptamold while it was still soft, to make “rock” walls. I mixed 3 washes (1 part paint to 16 parts water) to use for painting – burnt umber, stone gray and yellow ocher – in 3 separate bottles. I kept another bottle of plain water close by to use to rinse out the brush. I started with the burnt umber wash and spotted different areas of the rocks and rock walls with this wash, not covering all the areas. I then switched to stone gray and did the same thing, and then used the yellow ocher. I continued this process adding more coverings of the washes in different area until the rocks became darker and quite variable in color which is the effect that I wanted. I also took a smaller brush and used a more concentrated (1:2) wash of each color to provide some extra color and highlights in just a few areas. For the tunnel portal, I used several coats of 1:10 washes of burnt umber and stone gray, until I achieved the effect of old, worn, weathered wood that I wanted. Using a small trowel and a foam brush, I spread this mixture over the entire terrain where snow would have fallen naturally, but not on the fronts of the rocks or cliffs except in very tiny amounts where snow may have naturally attached to the small outcroppings and irregularities on the face of the rocks. This latter effect can be achieved by “dry-brushing” the front of the rock face in a downward fashion with the foam brush containing only a small amount of the snow goop that has mostly been brushed off. I used a purchased bag of evergreen fir trees sold as flat moldable tree stems and including a separate bag of green foliage. You have to first twist and mold the tree stems using pliers to get the shape you want. Then I sprayed the stem with 3M Spray adhesive and manually placed clumps of foliage on each branch till I was satisfied with how it looked. Then I stuck the trunk of the tree into a hole in a scrap piece of foam for storage till the glue dried. After the tree was stuck in the foam I sprayed the surface of the tree with a light spray of the adhesive and then sprinkled the dry white snow on the tops and sides of the tree. I did this with each tree individually.I then let all of this dry over the next 24 hours. I placed the train that I wanted to use on the track in a position that I thought would be the most photogenic. I didn’t glue it down but if you’re going to move your diorama around, you may want to use some silicone sealant to glue down some of the wheels to keep the train from falling off the track. 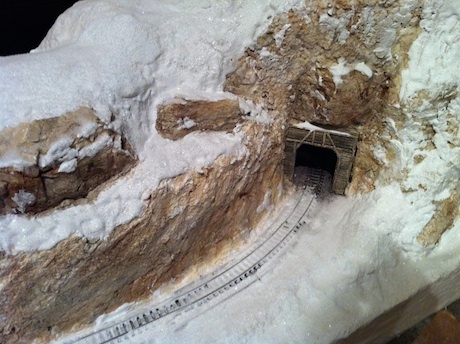 Then I made holes in the mountainous terrain of this winter diorama with a drill and placed a drop of white glue in each hole. Using needle nose pliers, I picked up each tree by the trunk, pulling it off the foam storage block, dipped the bottom of the trunk in the gloss medium and then placed the tree in the hole. I smoothed out the gloss medium at the base of the tree with a wooden stick and sprinkled some white snow around the base using a spoon. Then I sprayed the whole diorama with hairspray and again sprinkled white snow over the whole area including the tops of the locomotive and the rail cars. As a finishing touch, I used crystalline powder to sprinkle over the entire scene. This really makes the snow sparkle just like it does naturally when the sun shines on it. I could add more details to this scene, like maybe a wooden fence, small bushes, more trees, fallen logs, icicles on the rocks, small ice puddles, and perhaps a small wooden shed – all covered with white snow. This may dress it up some, but I kind of like it the way it is – simple, clean uncluttered. I can always add some more stuff later. I think I’ll put a Christmas wreath on the front of the locomotive for the Holidays using a pipe cleaner formed into a circle, painted green with a little red on the bottom of it to represent a bow. 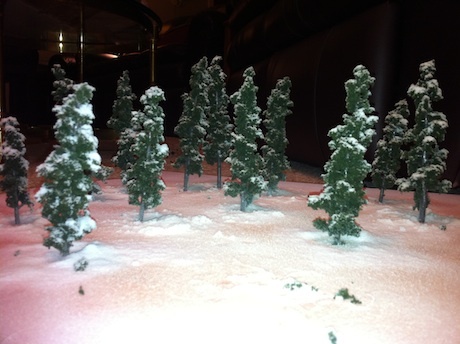 Place your completed winter diorama in the living room on a side table near your Christmas tree or perhaps on the coffee table. Then sit back and listen to your family and friends marvel about your very unique, artistic three dimensional model that you created. From "Winter Diorama" To "Winter Scene"
From "Winter Diorama" to "HomePage"